Alternative Medicine, Second Edition 2 Edition The "Bible" of Alternative MedicineLearn the health secrets that millions of readers have discovered in the book that is revolutionizing health care in the United States. 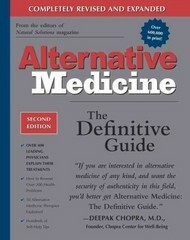 Alternative Medicine: The Definitive Guide is packed with lifesaving information and alternative treatments from 400 of the world'¬?s leading alternative physicians.Our contributors (M.D.s, Ph.D.s, Naturopaths, Doctors of Oriental Medicine, and Osteopaths) offer the safest, most affordable, and most effective remedies for over 200 serious health conditions, from cancer to obesity, heart disease to PMS. This guide is easy enough to understand to make it perfect for home reference, while it would also make a fine resource for health care providers interested in learning more about alternative medicine.70% of Americans currently use some form of alternative medicineThis 1,136-page encyclopedia puts all the schools of alternative medicine-50 different therapies-under one roofHighlights dozens of actual patient stories and physician treatments.